The New Year offers and opportunity for new beginnings. You will think about New Year’s resolutions. It’s impossible not to, since the media makes us all feel that we need them since we must have failed somehow in the previous year. I don’t think trying to improve means that before there was failure. Life is about growth and moving on and just getting “better” (whatever that means to you). As I get older, I pay more and more attention to eating well and exercising. Some days are better than others. Some weeks are better than others. Overall, I aim to stay as healthy as I can while having fun and embracing the life I’ve been given. So why did I name this post “Fast Food”? Because sometimes you don’t have time to think and plan for what goes in your mouth. Sometimes you look in your cupboard and refrigerator and wonder how in the world this is supposed to be a meal? Let alone a healthy one. So, I present you with a couple of quick solutions that require a bit of work but are easily adaptable to what you have on hand. Take one acorn squash, sliced and seeded, and cut it into wedges. Brush with a little oil and seasoning, salt and pepper are fine. Lay it out on a cookie sheet and place in a hot oven, 400 degrees is good. Turn it over after about 15 minutes and watch it. It should look golden and be soft when poked with a fork. I’ve done this under the broiler also. It’s a little faster but does require more attention so it doesn’t burn. Remember my trick of making dried beans ahead and freezing them? This is a reason why. You will have healthy beans ready to use in your freezer and it is much cheaper and easier on the environment to cook dry beans. And it’s not hard! Just dump a bunch of beans into a bowl or pot and cover with lots of water so they can double in size and stay submerged. Do this in the morning before you go to work or school. When you get home, pour off the old water and refill so the beans are again covered well with water. Bring the water to a boil, lower to simmer and cover loosely (otherwise they will boil over and make a mess). I think it takes about 45 minutes, but you really should look that up because I just keep checking on them and when they are soft, I rinse them off. I don’t time it, sorry. When they are cooled, you can put them on a tray or in a large zip lock baggie spread out. Freeze them loosely so that you can pour out what you want when you are cooking. 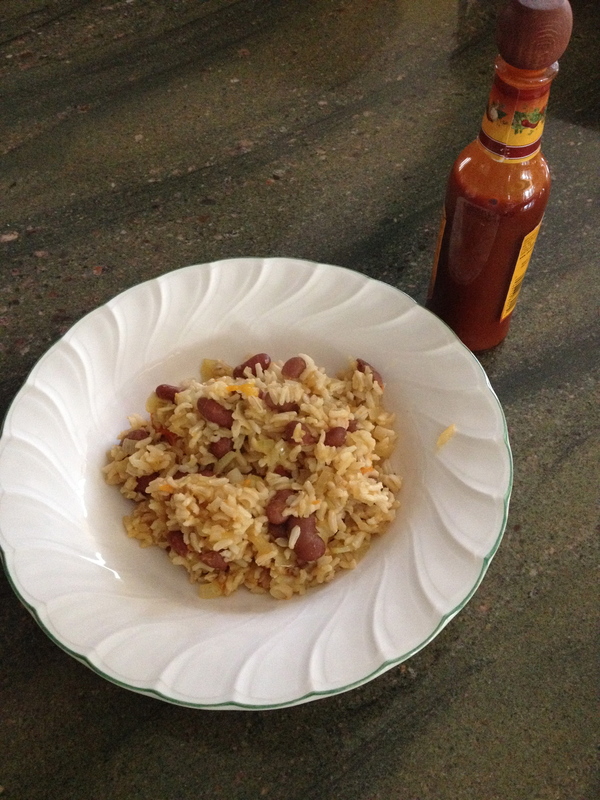 Now back to the Beans and Rice. 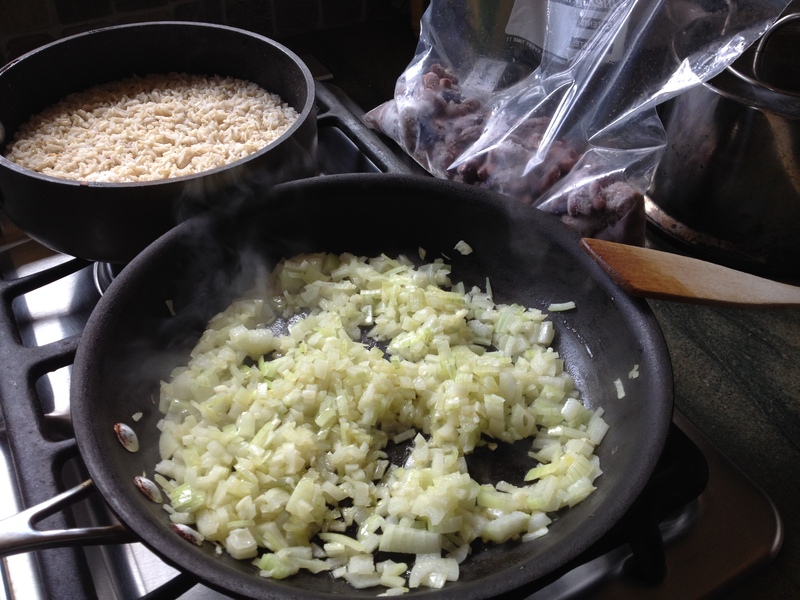 First, sauté chopped or sliced onions in coconut or olive oil (your choice). Then add cooked rice (brown or white or basmati, your choice). Add cooked beans (red kidney, black beans, again – your choice). When it is all warmed up, season as you like. Sometimes I add soy sauce or tabasco sauce, depends on my mood! Heat the oil first. Then, put all the ingredients into the pan together. Cut them into the sizes you like. 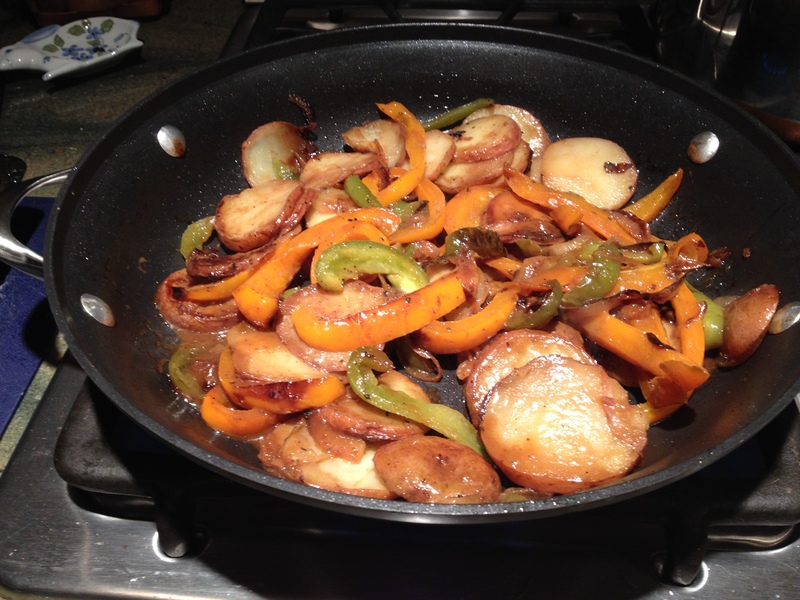 Make sure your pan is large enough for tossing and turning as they cook. 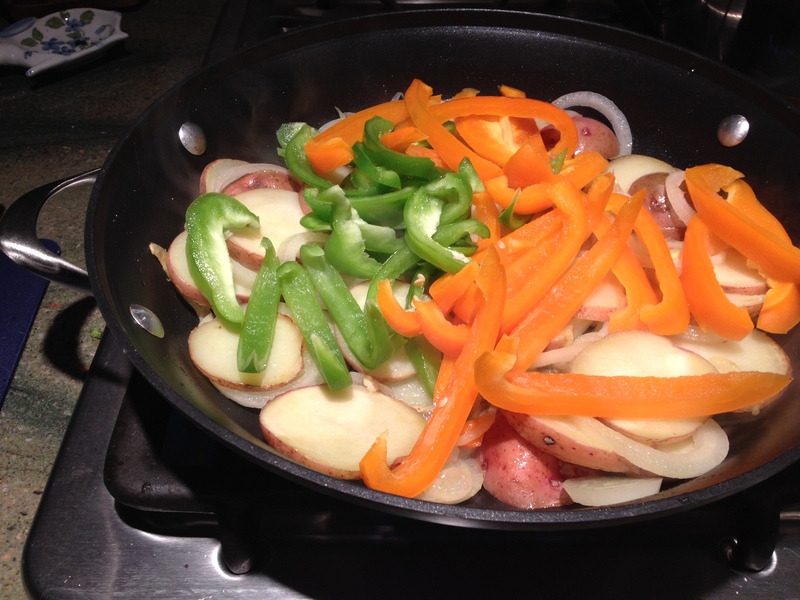 If the potatoes are taking too long, cover the pan for a little while. When all the vegetables are cooked to your liking, add the Finishing Sauce. This is tasty and very quick. There are some people who prep their vegetables for cooking and eating as soon as they come home from the store. This would definitely save time. However, I am not one of these people (and I have accepted this) and I don’t find that these vegetables take long to prepare. The last thing I want to leave you with is a sandwich. This is a simple, open faced sandwich that is incredibly fast, easy and relatively healthy. I’m not sure it even deserves a “recipe” but here it is anyway and I hope it inspires you to experiment on your own. 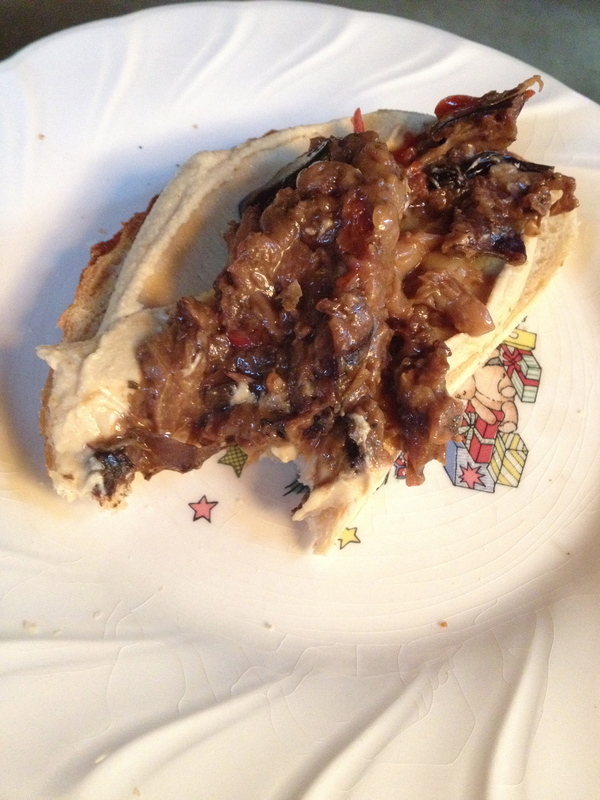 Toast the bread, spread with hummus and top with eggplant! As you can see, I took a bite before the picture because I couldn’t wait! Those all look great! 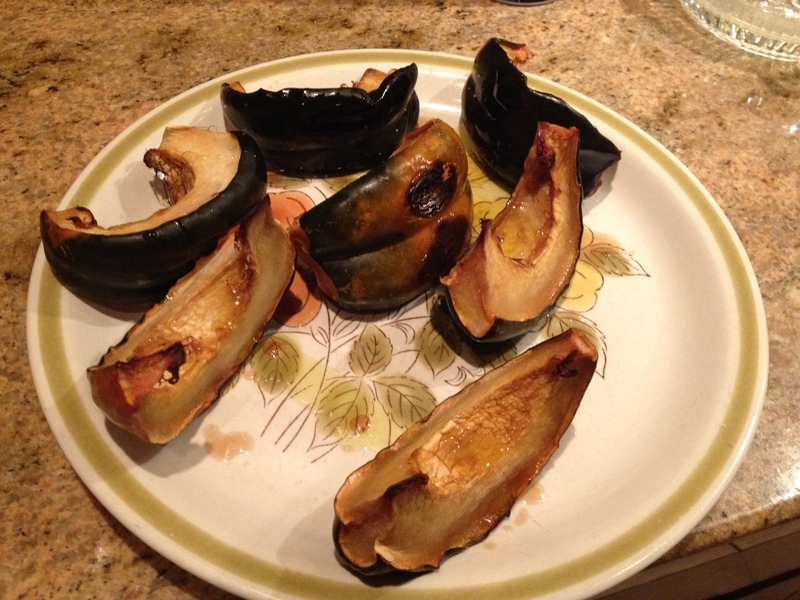 Roasted acorn squash is one of my absolute favorites. I love cutting it in half and using it as a bowl for soups and stews. Ani, I really have to try the squash bowl some day. It sound wonderful!